is our theme this month at FSC. We all have some tree stamps right? Now is your chance to play with them to your heart’s content. This card is a simple Christmas card. Christmas seems to creep up on us doesn’t it? 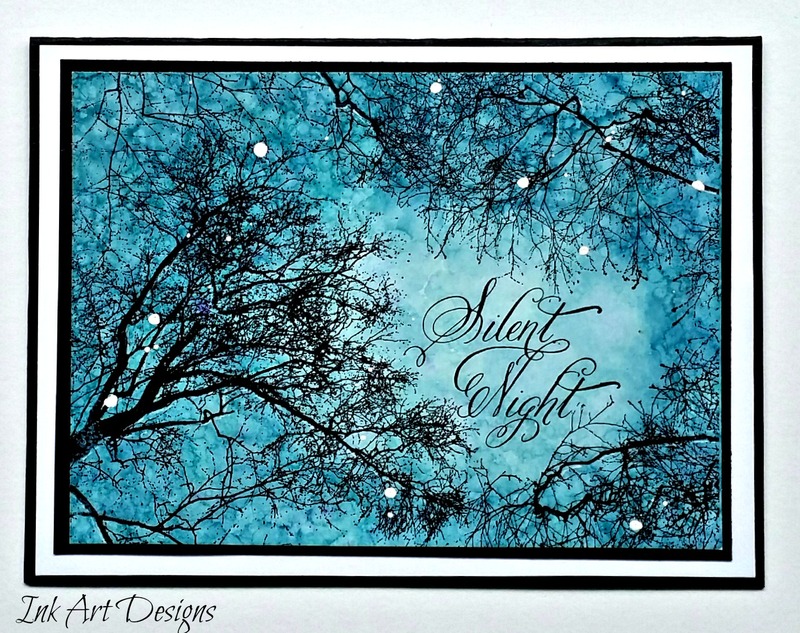 The background is made using a mix of blue alcohol inks. I love how this gives a real mottled effect, perfect for a night sky. When you add drop or two of the blending solution, let it sit for a minute and then blot, it has a bleaching effect. After working out roughly where the words would go, I used the blending solution to lighten this area. To finish I have splattered some white paint from a paint pen…I think it adds that starry night look. And a little white gel pen around the branches finishes this card off. A super creation Dot, so atmospheric and it looks like sunlight twinkling through the trees. Even though I have a replica of this on my shelf I still love it sweets, lol. Another stunner Dot! Love the colours, Christmassy yet almost spooky too – great stuff! Wow Dot, this is a great creation… so atmospheric. Wonderful! I love it. A beautiful Christmas card Dot, love the bleached out effect, looks like moonlight through the branches. Great stamping. Thanks for your visit to my first blog, such a nice comment you left. I'm crazy for this perfect card. It's the kind of thing I hope to be able make someday, just lovely.